For frequent travellers, it has also opened a new 2,330 sqm Delta Sky Club with the first ever outdoor terrace – the Sky Deck. The new SkyClub lounge is situated (via a very discreet door) around Gate B32. You take the escalator up into a wide lobby area with a receptionist desk, and, to one side of reception, the doors through to the VIP Ciroc Room (I peeked in, it looks like a stylish sitting room/ library with shelves of art books). The new lounge is large, but broken into several distinct areas, including a restaurant, work area, bar and the SkyDeck, which is a great place to relax in good weather, though note that there is a “No Smoking” policy out there. I was there for the opening of the lounge, and so spent several hours looking around the club, working, and even taking a shower at one point. The restaurant in the SkyClub has complimentary snacks such as yoghurt-covered pretzels, Chinese spicy crackers and nuts, but you pay for the “premium” menu, even if flying business class. There’s no problem with sitting in the restaurant and working, and for once there are plenty of power points situated around the lounge, necessary when everyone seems to have a minimum of a smartphone with poor battery life and either a tablet or laptop computer needing charging. The free wifi in the lounge worked well – no log in details are necessary. The washrooms and shower are situated on separate corridors towards the front of the SkyClub. If I have a criticism here it is that there are not enough of them (I can only speak for the men). With only a handful of urinals and cubicles, there will be a queue at busy times. For that reason, I went looking for another toilet and the next thing I had been offered a shower. I was in one of the larger ones – for restricted access, but the rooms are all similar in decoration with smart red tiling and a toilet, basin and shower. I’ve read elsewhere that people weren’t impressed with the power of the shower or the warmth of it, but mine was fine. There are toiletries available if you do not have any with you. 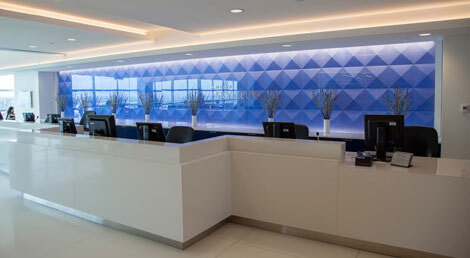 Now that the new Delta SkyClub is open at Terminal 4, JFK airport, it’s possible to spend some time in the lounge and appreciate what a pleasant space it is. 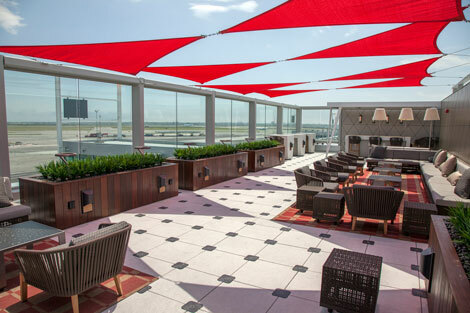 In part, this is because of the floor to ceiling windows at both sides of the 24,000 square foot lounge, and also the outdoor SkyDeck area, with view across JFK. It’s clear a lot of thought has been put into the design, and not just in the number of power points. 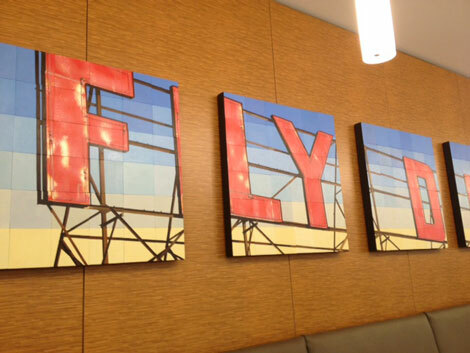 The seats are comfortable, the noise level even at busy times not intrusive, and there’s artwork on the walls. 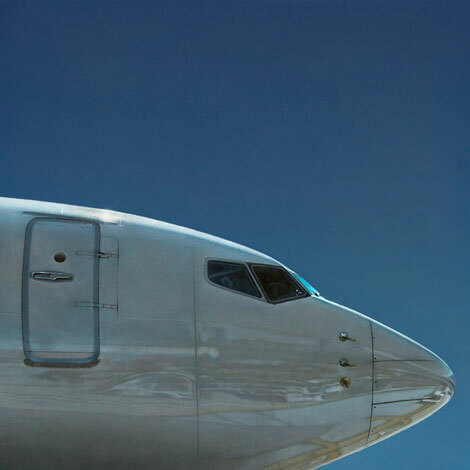 As you’d expect, the theme is aviation – clouds, aircraft and “the view from the window seat”, with aerial shots of beautiful places around the world. These aerial shots are normally featured in five or six panels, and range from rice paddies in Thailand to coral formations on the Great Barrier Reef. In the main restaurant, opposite the bar, there are two sets of five panels, showing the iconic 1950s Delta sign from the top of the hanger in Atlanta. This was photographed firstly by day and then by night, then divided into panels, with each panel in turn reassembled into 36 panels by Jeff Cohen, an Atlanta-based artist. This must have been painstaking – taking a photo, painting the photo, breaking it into five squares and then each of those five squares into another 36 squares and painting each one individually before reassembling them, and accepting that the squares, no matter how carefully painted, won’t quite match up. That’s a measure of why your eye is drawn to it, and also echoes the artist’s intention. 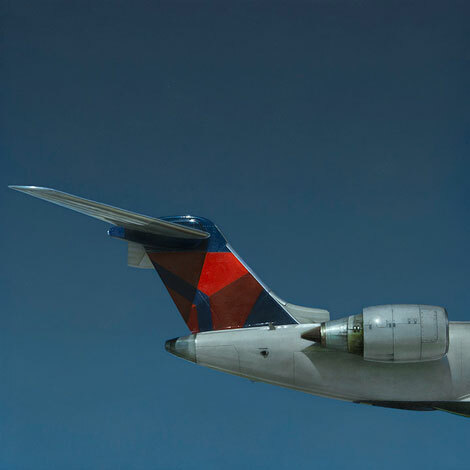 Also in the restaurant is another set of panels, this time of parts of a Delta aircraft, paintings by Neil Hollingsworth. Also based in Atlanta, Hollingsworth was briefly a mechanic with Eastern Airlines and a surgical nurse. 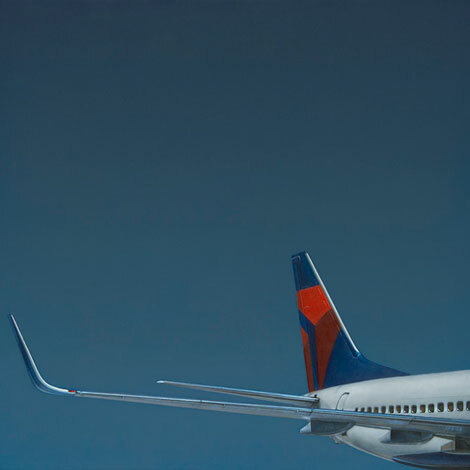 Susan Nicole Gibbs, who arranged and curated the art, told me that she believes the photo-realism of his oil paintings as shown here is reflected in these paintings. 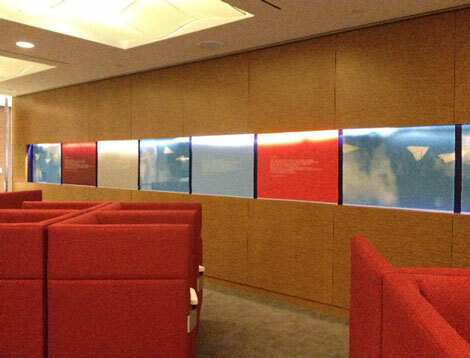 A separate room containing Hush Pod seats has a poem in nine languages (including many of those of Delta’s Skyteam partner airlines), along with an intriguing installation of how to fold a paper airplane. 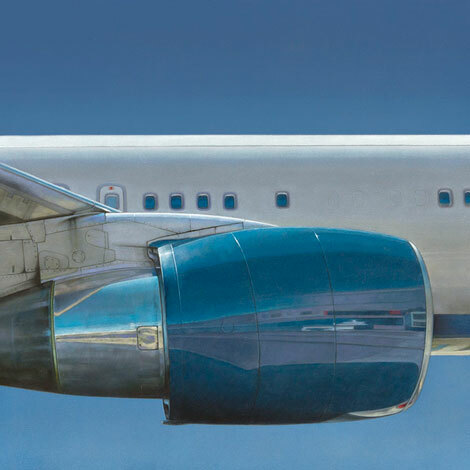 Airplane enthusiasts will probably be most interested in the scraps of airplane skin. 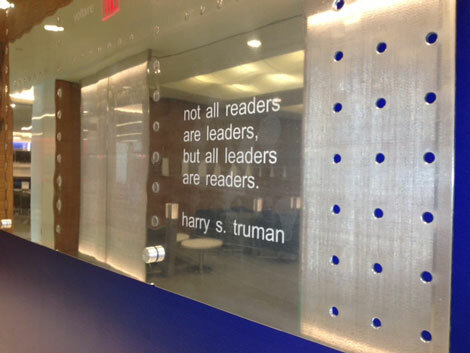 The first part is on the way into the lounge where the magazines are stored, and on a burnished piece of Boeing aircraft exterior (B747 Exterior Skin Section, hand-polished, mixed media, substrate courtesy of the Boeing Company) various quotations from famous authors and poets have been etched – everyone from CS Lewis to Groucho Marx. Finally, while using the washrooms, take the time to look at The Delta Photography Initiative which each year will feature work from student and faculty members of the top photography programmes or colleges in the New York area. 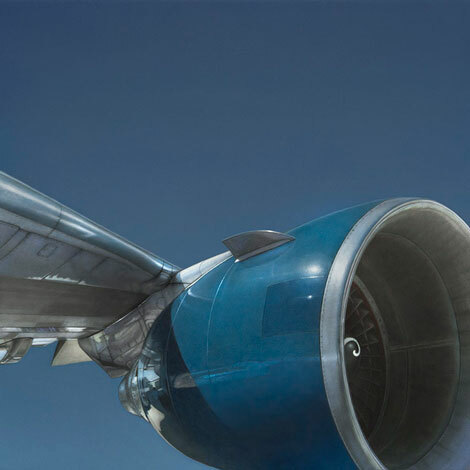 The inaugural one is by Bard College and has 14 photographers showing work on the theme of flight. A really good lounge. Once free food for business class passengers has been sorted (probably when the joint business with Virgin is approved for London to New York flights) it will be world class.